We are offering Oil Filter Wrench to our Client. Hand-driven wrench, suitable for most oil filters. These lubricating tools have metal body, made of steel or brass. 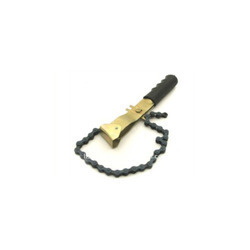 We are engaged in providing an extensive range of filter wrenches to our clients. Our range includes belt type, chain type, socket type, cup type filter wrenches which are made using optimum quality raw material and sophisticated machinery. We conduct various tests to measure the quality of our products before delivering to the clients. 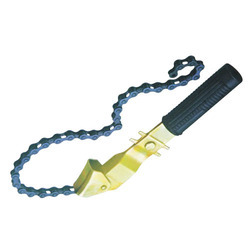 Articulated filter wrench with swivel action tightener. Suitable for oil filters with limited access. Capacity: 75 - 110mm.